Where did our universe come from? People have been trying to answer this question for thousands of years. The twentieth century brought new discoveries in physics and astronomy that led scientists to develop the Big Bang theory–a detailed idea that describes how the universe formed. According to the theory, the entire universe began in a single instant, in an unimaginably powerful explosion . That explosion created all time and space, all matter and energy–everything in the universe as we know it. This book tells the story of how scientists’ observations of the stars let do the development of the Big Bang theory. Scientists were sure that species change over time, but no one could explain how. In the 1800s, Charles Darwin’s studies of thousand sof specimens of living things showed that no two individuals of any species were exactly alike. He realized that over millions of years, some individuals had traits that gave them an edge for survival. As they reproduced, the succesful traits were inherited by later generations. 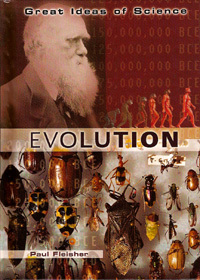 This book explains Darwin’s theory. It shows how discoveries in genetics provided more evidence that the thory of evolution works. Scientists in many fields continue to make new discoveries that provide further proof of Darwin’s world-shaking ideas. Both of these titles are part of the Great Ideas of Scienceseries, for which the author also served as consultant.